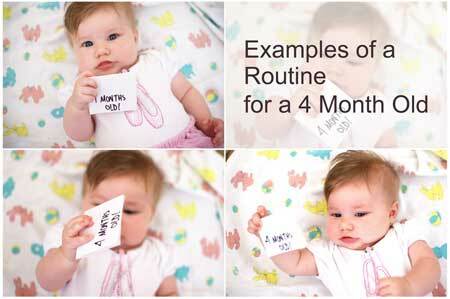 At 4 months of age your baby is making some huge changes in terms of development and routine. She will be more aware of her environment, will engage with you and her toys a lot more, and is developing a good memory. And she has probably found her voice! Keep reading for examples of 4 month routines. Will stay awake for around 1.5 hours before needing a nap (although this can range from 1 hour 15 minutes to 2 hours). Many parents become confused and frustrated when sleep problems seems to emerge out of nowhere at about the 4 month mark. What they describe as once “text book” babies, their little ones suddenly resist naps, won’t go down at night, wake frequently during the night, start wanting night feedings again or wake up early. There are probably a lot of things going on behind the scenes that are responsible for the 4 month problems, but here are a few of the most common things you can look for so help get your days and nights sorted again. Tracy Hogg in The Baby Whisperer suggests that a 4 month old should be on a 4 hour routine. That means that every 4 hours, the routine is repeating itself. For example, wake for a feed, 2 hours awake and then two hours asleep. She says that a lot of problems at the 4 month mark are because babies are still being restricted to a 3 hour routine which they have outgrown. Sometimes babies don’t naturally move onto a 4 hour routine and need your help getting there. Keep in mind though that not every child is ready for a 4 hour routine by 4 months of age, yours may be able to go 4 hours between feeds but not stay awake for 2 hours, or vice versa. Trial and error is the only way to find out, but remember, pushing your baby into a routine that they are not ready for will just cause more problems. Even though your baby’s awake time (time between naps) might be lengthening, it is important to remember that the first awake time of the day will be shorter than the rest. Some 4 month olds can only handle an hour first thing in the morning before they need to go down for their first nap. Having an awake time that is too long first thing in the morning leads to a restless first nap and a downward spiral of an overtired baby for the rest of the day. Your baby may be having trouble sleeping because they have had a growth spurt and need more calories. In the ‘olden days’ babies were started on solids at 4 months, so if you think this could be the problem perhaps check with your doctor if starting solids is an option (the recommended age for starting solids varies amongst countries and seems to change every few years, so check with your doctor or pediatrician if you are not 100% sure). A large majority of 4 month olds start waking at the 4-5am mark. You might have noticed your baby waking for an early feed, or even just waking early and talking to themselves or their toys until you come and get them. Unless they are upset, hold off and see if they will resettle and go back to sleep. This early waking at this age is very common, but starting their day too early will create sleep problems. As babies grow up sometimes as parents we think they can handle more and stay up later. Most baby sleep experts recommend 7:30 as the latest time for bed, but somewhere between 6pm-7pm being the best time to go down of a night. Believe it or not, the later the bed time often the earlier the wake time, so if you have an early riser you could experiment with an earlier bed time. Don’t forget that around 19 week of age your baby is likely to go through a wonder week which will probably throw their routine off for a week or so. This is okay, just go with the flow and do what you need to support your baby through this developmental leap. You will probably find that as your baby is coming out of their wonder week (or sometimes a few weeks later) their routine will magically change and fall into place on its own. Question: Hi, my son is 18 weeks. From about 9 weeks he started sleeping through the night – I would put him down at around 6.45 after bath and breastfeed and wake him up at 10 for a further bf top up feed. He would then go down until 6/6.30am. He really needs lots of sleep during the day or I notice he gets very cranky! He usually has a morning nap in his cot from 7-9am then another from about 10.30-12 and another sleep (usually in the buggy) from 1.30-2.30 and another afternoon nap around 3-4pm. For about the last 3 weeks or so he has been waking at 5am and chatting to himself for almost an hour (it’s actually quite sweet to listen to) showing no signs of going back to sleep. My husband gets up for work at 6am so after an hour or so he will take him out if the cot and change him before I start to feed at around 6.15. I feel that this has now become his routine! I can’t see the 5am wake up changing and was wondering if you had any tips/ideas to help him stretch closer to 6 again. Reply: You are doing a WONDERFUL job with your son. Sleeping through the night at 9 weeks is textbook and testifies that you are right on top of his cues and needs for food and sleep during the day. Well done. The early waking is very very common just after the 4 month mark. The chatting to themselves is cute isn’t it? Don’t worry, he’ll go back to ‘normal’ on his own. Just make sure you keep your eye on that first wake time and don’t let it stretch too long before his first nap, or you’ll end up with an overtired baby for the rest of the day. And, don’t be tempted to move his first feed any earlier, or his body clock will change and he’ll get stuck in that early waking pattern, waking for food. Question: I’m just wondering what the “dream feed” is in your sample 4 month old sleep schedules. Are you waking them up and feeding at 10:30? 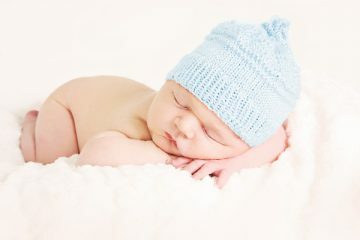 Reply: The aim of the dreamfeed is to feed your baby while they are still asleep (it can take a week or 2 of practice). That way, they are learning to have long stretches of sleep, but their tummies are still full. Question: My little one is 4 months and 1 week. She is awake for an average of 2hrs between her naps and feeds every 3hrs but she only catnaps! She’ll go for her nap without any fuss and settles very quickly but wakes up 30-45 mins later. She sleeps through at night from 7pm-6am but is having 3-4 naps a day. Is this something I should be concerned over or will she eventually sleep longrr as she starts being awake longer? Reply: It doesn’t sound like anything to be concerned about at all Pam – very normal! She will eventually start to sleep longer as she gets older, but this doesn’t usually start to happen until 9-12 months of age. 7pm-6am for a 4 month old is huge – well done! I’m sure there are lots of jealous mommies reading that! Also, have a look at my article about 45 minute naps here, it might shed some additional light on what is happening. Question: My son is 4 months old and isn´t the best night sleeper. He always goes to bed at 7pm, sleeps until about 11pm and then wakes up pretty frequently after that. I wanted to try and get him on one of your sample schedules to see if more regular naps might also help with his nighttime sleep. He feeds about every 3 hours and naps for 45 min to 1 hours so I am trying to go by a schedule similar to the 45min napper schedule you have on your website. My problem is that it takes him such a long time to fall asleep for naps. I have tried shussing and padding his belly, rocking him, nursing him…it still takes him at least an hour from when I start to put him down until he actually falls asleep.So that sort of throws off the whole schedule. Any advice? Reply: It sounds like you are putting your son down too late – but that is just a guess. When you look at the sample schedule, the ‘sleep’ time starts when they are actually asleep – that isn’t the time that you start winding down to sleep. So you really need to start getting your son ready for sleep 15-20 minutes before his awake time is over. 1. Become at expert at reading his sleepy signs. Every baby has their ‘magic time’ when they are more easily able to fall asleep. Finding it is the tricky bit! Look for his sleep signs (they are there, even if you don’t know what they look like yet). Eye rubbing, or yawning are late sleepy signs which means you’ve left it too late. Getting him to bed when he is ready is more important than following a written routine. 2. Reduce his awake time. I have a feeling that if you reduce his awake time he will find it easier to fall asleep. Taking an hour to fall asleep at this young age is usually an indicator of being over-tired or over-stimulated. 3. Keep his awake time very calm and low key. Not too much stimulation, not too much time left under a baby gym or mobile. Sitting in a rocker/bouncer watching you, or interacting with you is going to be best. This will rule out the over-stimulation problem. 4. Try a dreamfeed at 10:30. If you can get to him before he wakes naturally at 11pm you might disrupt his not-so-desirable cycle! Question: My daughter was 4 months old on the 15th. She goes to bed usually between 7-730pm. Usually wakes up between 730-830am. Sometimes she has a quick nap around 9-930, then usually has a 2 hr nap somewhere between 11-3. Then lately around 430-5pm she’s cranky. She won’t go down for a nap again until she’s cried herself exhausted. She won’t eat anymore so I know she’s not hungry. Just can’t seem to get her onto a schedule. We’ve also had a very busy last couple weeks where no schedule has been able to be implemented either. Any suggestions??? Reply: At 4 months of age your little ones can only be awake for 1 hour 15 minutes to 2 hours (where in this range they fall will depend on their individual sleep needs). If they’re kept up longer than this they might appear to be okay at the time, but this tiredness will carry forward through the rest of the day until you have a cranky baby at the end of the day or a night waker. At this age, in my opinion, they are not able to have a day that is based around the clock, unless their wake and sleep times are VERY consistent (ie they are waking within 15 minutes of the set time every day eg waking from their first nap at 9:30 one day, 9:40 the next, 9:20 the next). I would suggest putting them down for their naps based on how much time they have been awake, not the time that the clock says, and without waiting for tired signs (sometimes tired signs can change or disappear for a while at this age). you have a great night sleeper there! There isn’t anything about her day that looks particularly off either, just make sure she isn’t staying up for too long between naps. The crankiness at the end of the day could indicate tiredness that has built up through the day, or it could be overstimulation (too much time in rockers/swings/bouncers/baby gyms with toys hanging in their face can do this). Dinner time is often called ‘witching hour’ for babies, so you’re not alone! This is the perfect time for a walk in a stroller, if that’s possible at all.